Congratulations! You have found Fish Window Cleaning of Knoxville, Powell, Karns, Pigeon Forge, Sevierville, Fountain City, Halls, South Knoxville, Seymour, Clinton, Kodak, Rockytop, Blaine, Heiskell, Strawberry Plains, and Gatlinburg, TN! We are the first choice in the Knoxville area for residential and commercial window cleaning, gutter cleaning and power washing. Our window cleaning professionals are licensed, bonded and insured. 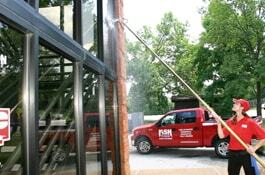 Fish Window Cleaning has been making an impression on businesses, home owners and their neighbors since 1978. Our professional staff will make YOUR home or business shine above the rest. We understand that you're busy. That's why Fish is a great choice to take care of many items on your to-do list. We not only make your windows sparkle but we also clean mirrors, ceiling fans, light fixtures/chandeliers, awnings, hard water stains, and screens. We do pressure washing, gutter cleaning, and construction clean-up too! The best thing about Fish is that we leave your home looking the exact same way it did when we came in - except for your shiny windows, of course! Our cleaners wear fresh, red shoe covers and we use absorbent cloth pads below each window as we clean to protect your carpet or wood floors. We maintain storefronts and commercial buildings, helping you to achieve a polished look to give your customers a good impression. We provide cleaning ranging from weekly to annually, tailoring our services to the needs of your business. We've led the industry with a premiere safety program to ensure the protection of our customers and cleaners. We also provide the peace of mind that licensed, bonded, and insured window cleaners will be maintaining the appearance of your business. Regardless of your budget or schedule, we can put together a program for you. Click on the "Free Estimate" icon at the top of our website!